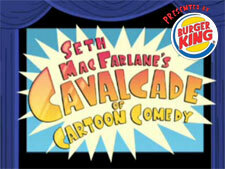 Burger King has a new online advertising vehicle: "Seth MacFarlane's Cavalcade of Cartoon Comedy." The short comic cartoons were created exclusively for Burger King. BK's 'The King' appears at the beginning of them. Seth MacFarlane is the creator of the highly acclaimed and hilarious, animated US televisions series "Family Guy" and "American Dad!" There will be new episodes each week. The first 2 appeared on YouTube yesterday, but you might also see them as mini-video ads on other web sites. And, of course, you can watch them below. It is an innovative, and funny, way for BK to set itself apart in the fast food realm.